Irishman James Finnegan and Mary Anne Long of Chilwell were married in 1873. James was employed by Victorian Railways and worked on constructing the Ballarat to Ararat railway line. Most of the couple’s eleven children were born at Beaufort and Buangor, towns along the line. Around 1889, the Finnegans moved to Hamilton, taking up residence on Mill Road. A son, William was born in that year. Terrence Finnegan was born in 1893. The youngest of the family, Rose, was born in 1895 also at Hamilton. Terence attended St Mary’s Convent School and when he finished his education he worked as a tailor at John Thomson & Co. On 29 January 1915, Terrence’s older brother William enlisted with the 22nd Battalion. One of Terrence’s sisters, Mrs Elizabeth Carroll lived at Brighton and he went there to enlist on 9 July 1915. He left Australia on 23 November 1915 with the 7th Battalion 12th Reinforcements. During the first six months of 1916, Terence was in Egypt. While at Tel-El-Kabir, Terence was transferred from the 7th Battalion to the 59th Battalion then to the 58th Battalion where he remained. On 17 May 1916, Terence was hospitalised for two days with sunstroke. Around a month later, the battalion was off to France. The 58th Battalion arrived at Marseilles on 23 June 1916. On 15 July, while in the field near Steenbecque, France Terence was wounded. 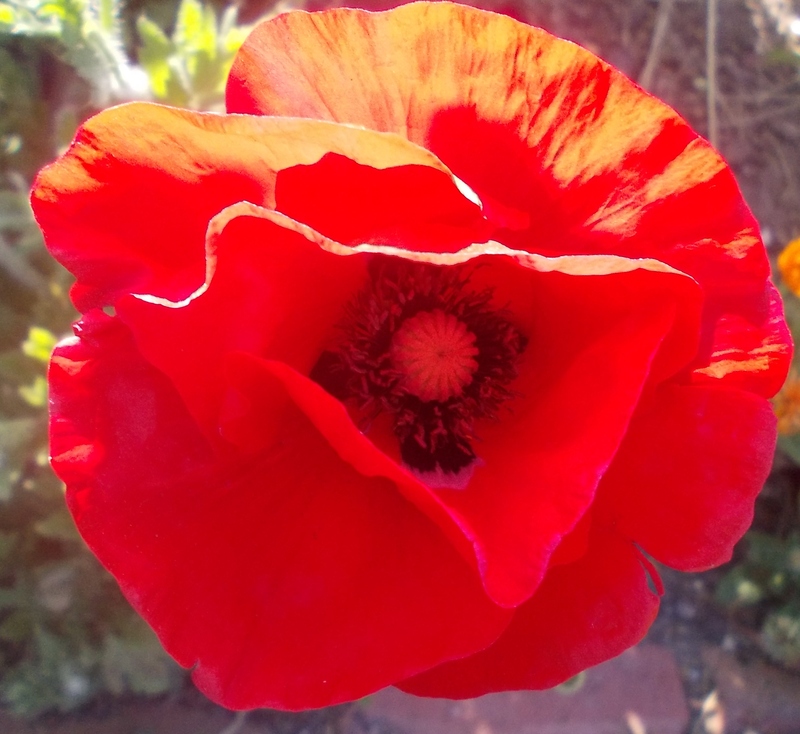 The battalion had faced heaving fighting on that day and 102 of the battalion had wounds. Terence had a gunshot wound to the hand and right leg and was transported to the General Military Hospital at Colchester, England. The Hamilton Spectator reported on 4 August that the Finnegans had heard Terence was slightly wounded. However, a telegram was sent to James Finnegan from the Defence Department reporting Terence had died of wounds. In the Hamilton Spectator of 31 August, the Finnegans placed a Bereavement Notice thanking people for their sympathies for their loss. Realising their error, the Defence Department sent another telegram in September and it was reported in the Hamilton Spectator of 14 September 1916 that Terence was only wounded. Terence rejoined his unit on 22 January 1917 while the battalion was in the frontline near Bernafay Wood, west of Pozières. 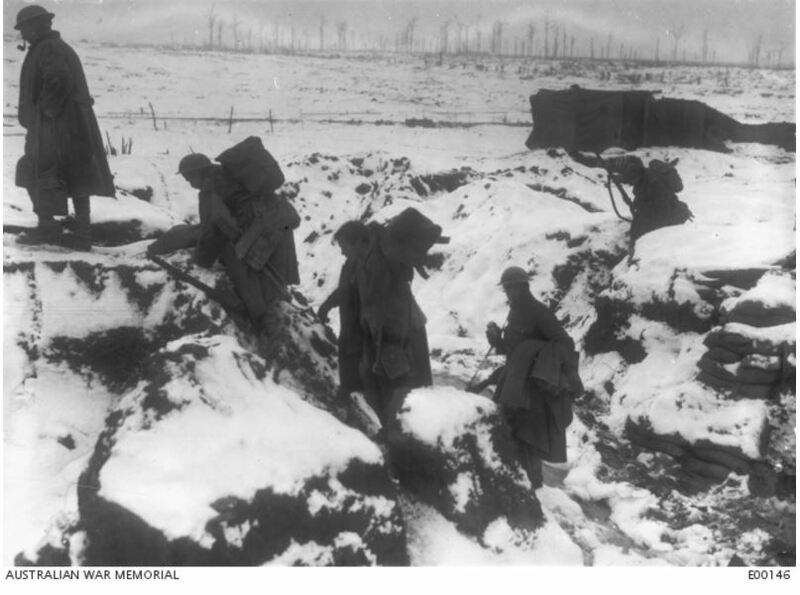 The conditions were harsh with a particularly cold winter upon them and snow hampered the soldiers. The photo below shows soldiers at Bernafay during January 1917. From late March until late April, Terence had time in hospital at Rouen with trench feet. He was back with the battalion on 21 April then at Mametz on the Somme. They were at Mametz until 8 May when they moved to Bapaume and the Beugny-Vaulx line. 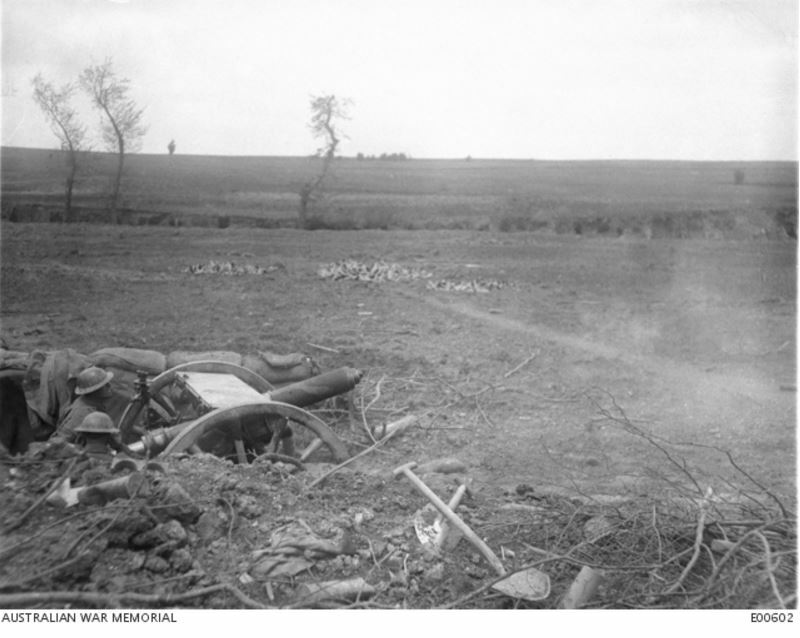 The plan for 12 May was to continue the attack on Bullecourt. While on rations fatigue around 9:00 pm on 12 May, a shell killed Terence and three others, including Hamilton’s Horace Westgarth, in the area known as Death Valley. He was buried where he fell somewhere on the outskirts of Noreuil. Again the Finnegans placed a Bereavement Notice in the Hamilton Spectator but there was no mistake on that occasion. In August 1917, James Finnegan planted a tree for Terence along Hamilton’s Anzac Avenue. Around 1919 James and Mary Ann Finnegan moved to Middle Brighton, Melbourne. In 1943, they celebrated their 70th wedding anniversary. James was ninety-seven and Mary Anne ninety. James died the following year at Middle Brighton and Mary Ann died in 1948 aged ninety-four.